Make any room in your home or business more attractive and appealing by adding carpet flooring. Choose us ahead of any other carpet store because our knowledgeable staff provides you with superior service and extensive selections. Come to our local store for brand-name flooring and cost-effective prices on Berber carpet and many other styles of carpeting. We have the distinction as serving as the area’s only flooring center for Stainmaster™ and Karastan™ carpets - brands that are well-known and loved for beauty and quality. Ask our flooring experts to help you choose the type, brand, and fiber of flooring for your home and provide you with professional carpet installation. With our buying power, our store provides you with a wonderful assortment of selections. To help you narrow down the possibilities, ask one of our design and sales professionals for guidance. These experts work with you to locate carpeting that meets your requirements. Do you want gorgeous wool carpet that is soft and strong? We can show you samples of Karastan. Do you need carpeting for a household of children and pets? Select Stainmaster for its performance and style. When you’re purchasing new carpeting for your home improvement or remodeling project, you want to go to a carpet store with a strong reputation for customer service, affordable prices, and integrity. With a full line of carpeting in various colors and styles at competitive prices, you know you’re able to find what you’re looking for. In addition, you know that if you’re not satisfied with your purchase, our Ultimate Confidence Guarantee means we’ll do anything in our power to make it right. Count on our store’s strong reputation for service, affordability, and trustworthiness to get you through your flooring project. Whether you have questions about the durability of a certain type of carpeting or you’re unable to decide which style best matches your interior décor, our helpful staff is always able to offer information and advice to help you make a decision. 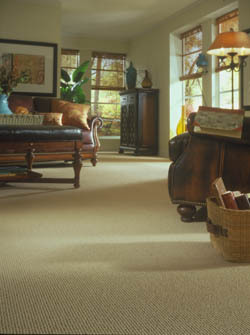 Unlike other types of carpet, Berber carpet fibers feature tiny loops rather than small strands. This style of carpeting can be traced back to the Berber tribes of Africa that still create these traditional carpets today. Unlike the traditional style, most Berber carpeting sold by our store is made of synthetic and blended fibers like nylon, olefin, and polyester. Berber is a popular choice for commercial environments as well as homes due to its incredible durability and longevity. Because of its looped fibers, it is able to stand up to more wear and foot traffic. These loops also make it more spill resistant than other types of flooring because the fibers don’t soak up liquid as quickly, allowing you to soak up the spill before a stain can set in. Carpeting makes the ideal flooring for commercial use. This is because today’s carpeting is manufactured to perform. We offer brands and styles of carpeting flooring that resist stains and withstand heavy foot traffic. Ask one of our experts to come to your business with lots of samples, so you can show you how each looks in the proper setting. The warmth and softness of carpeting makes your business look welcoming and appealing to your customers and employees. Add an area rug or two to each room of your home to add pizazz to the space. We offer a variety of brands, styles, shapes, and sizes of area rugs - including Karastan - to complement the rest of your carpeting and furnishings and to protect the flooring. Place an area rug in a busy space to lessen the wear and tear on the floor beneath it or put one underneath a grouping of armchairs and an end table to designate a conversation area. Professional installation by our crew is also a good idea because many carpeting manufacturers’ warranties only cover products installed by a qualified professional. By allowing our skilled team to handle the installation, you have the benefit of properly installed carpets plus the knowledge that should anything unfortunate happen, you’re more likely to be within the requirements of the warranty. Best of all, you’re able to relax or concentrate on the rest of your home improvement projects while we handle the installation. After ripping out your old flooring, the technicians clean and level the subfloor and lay the padding. They measure carefully to use as few seams as possible. Those that they use are cut in a way to look invisible. They make sure that the carpeting is stretched smoothly and adheres properly. With such quality installation, you can be sure that your new carpets look stunning year after year. Contact us today to beautify your home with the color and softness of carpet flooring. We proudly serve residential and commercial customers in Valrico, South Brandon, Fish Hawk, Riverview, and New Tampa, Florida.